00:37 reza Use of uninitialized value $indexes in hash element at /usr/share/koha/intranet/cgi-bin/ins​taller/data/mysql/updatedatabase.pl line 11571. 00:38 reza is that gonna cause me an issue?? 00:44 reza pe` = ? ) 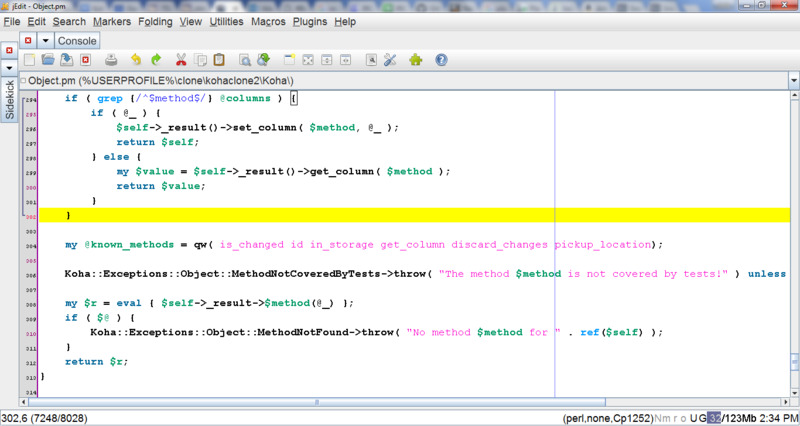 )" with ParamValues: 0='TPM', 1='STU-DEGR', 2='GC'] at /usr/share/perl5/DBIx/Class/Storage/DBI.pm line 1834. 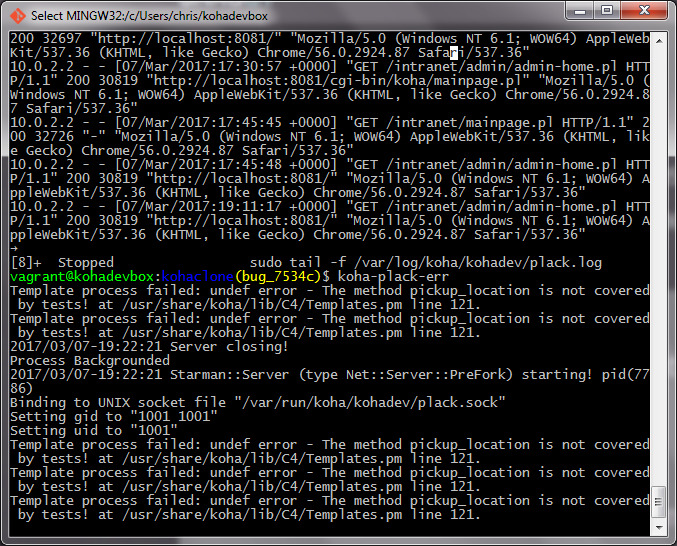 00:53 mtj reza: you are upgrading with packages, to koha 16.11.x ? 01:03 mtj hmm, what version are you upgrading from reza? 01:11 reza how to see the current version on command line? 01:48 reza due to the lack of reliable infrastructure we were thinking to hosting koha on the cloud, however, is it safe to do so? 05:43 huginn` drojf: The current temperature in Berlin Schoenefeld, Germany is 3.0°C (6:20 AM CET on March 07, 2017). Conditions: Light Rain. Humidity: 93%. Dew Point: 2.0°C. Windchill: -2.0°C. Pressure: 29.71 in 1006 hPa (Steady). 07:43 huginn` magnuse: The current temperature in Bodo, Norway is -1.0°C (8:20 AM CET on March 07, 2017). Conditions: Clear. Humidity: 47%. Dew Point: -11.0°C. Windchill: -8.0°C. Pressure: 30.24 in 1024 hPa (Rising). 07:43 huginn` magnuse: The current temperature in Marseille, France is 9.0°C (8:30 AM CET on March 07, 2017). Conditions: Mostly Cloudy. Humidity: 62%. Dew Point: 2.0°C. Pressure: 30.06 in 1018 hPa (Steady). 07:49 huginn` LibraryClaire: The current temperature in MainaustraÃ&#376;e, Konstanz, Germany is 5.8°C (8:41 AM CET on March 07, 2017). Conditions: Mostly Cloudy. Humidity: 83%. Dew Point: 3.0°C. Windchill: 6.0°C. Pressure: 29.95 in 1014 hPa (Rising). 08:23 huginn` drojf: The current temperature in Berlin Schoenefeld, Germany is 2.0°C (8:50 AM CET on March 07, 2017). Conditions: Mostly Cloudy. Humidity: 87%. Dew Point: 0.0°C. Windchill: -2.0°C. Pressure: 29.80 in 1009 hPa (Rising). 08:23 huginn` drojf: Error: No such location could be found. 08:23 huginn` drojf: The current temperature in Rue du Capitaine Jean Maridor, Berlin, Germany is 2.2°C (9:16 AM CET on March 07, 2017). Conditions: Mostly Cloudy. Humidity: 100%. Dew Point: 2.0°C. Windchill: 2.0°C. Pressure: 29.80 in 1009 hPa (Steady). 10:21 huginn` eythian: The current temperature in Schiphol, Badhoevedorp, Netherlands is 7.6°C (11:21 AM CET on March 07, 2017). Conditions: Overcast. Humidity: 88%. Dew Point: 6.0°C. Windchill: 6.0°C. Pressure: 29.94 in 1014 hPa (Rising). 11:32 A__A Hello. I'm investigating Koha, to see if it is practical for a small shop in Whitby, to put our community library "online". We already have our stock online, on a (3rd party) linux server. (Pretty sure it's linux.) Can we add Koha easily to this existing system? 11:41 A__A drojf: root access to the server. "Which distro". Hmm. So that sounds like hosting the thing on your own servers, not via a service provider. So OpenBiblio looks more likely. And easier to (con)figure, probably. 11:46 A__A I am a bear of simple brain. "Service providers for Koha". We don't have an actual real server, that's provided by a service provider. We interface to it via the web. 11:48 A__A But you need root access? 11:52 A__A Got it. Ok drojf. Where can I read about these basic starting-out Koha issues? I finally hit on IRC. Are there any videos anywhere that talk about requirements in a conversational, non techno-geek way? 12:00 A__A Yup. I agree, everything informatic requires technical knowledge, once you've decided it's a viable choice. But right now I'm looking at the feasability of Koha for our situation. Thank you for your help, again, from (for a change) sunny Whitby. 12:36 huginn` tcohen: The current temperature in Barrio El Refugio, CÃ³rdoba, Argentina is 23.2°C (9:36 AM ART on March 07, 2017). Conditions: Mist. Humidity: 80%. Dew Point: 20.0°C. Pressure: 30.01 in 1016 hPa (Rising). 12:37 huginn` druthb: The current temperature in Montrose, Houston, Texas is 22.1°C (6:36 AM CST on March 07, 2017). Conditions: Mostly Cloudy. Humidity: 95%. Dew Point: 21.0°C. Pressure: 30.01 in 1016 hPa (Falling). 12:49 huginn` Joubu: The current temperature in Ezeiza Aerodrome, Argentina is 17.0°C (9:00 AM ART on March 07, 2017). Conditions: Clear. Humidity: 60%. Dew Point: 11.0°C. Pressure: 30.11 in 1019 hPa (Rising). 13:54 huginn` marcelr: The operation succeeded. 14:13 cait Joubu: when did you arrive? 14:47 cait Joubu: did all your stuff arrive with you? 15:07 * druthb waves tiredly to gmcharlt. 15:14 kivilahtio but how is this done elegantly? 15:38 kivilahtio tcohen: and how is DBI::Mock installable? 15:42 kivilahtio tcohen: is Prices.t the only test using DBI:Mock ? 15:44 Joubu prove t/Prices.t => "All tests successful." 15:47 tcohen Joubu: why is it failing in Jenkins? 15:51 kivilahtio marcelr: is it possible to install DBI::Mock? 15:51 kivilahtio should I rephrase, can you get it installed? 15:52 marcelr just get rid of it ! 15:52 kivilahtio marcelr: you don't like it much ? 15:52 marcelr why this exception? 15:54 marcelr kivilahtio: which test is it ? 16:00 kivilahtio marcelr: why do we even have tests which are not? 17:12 Joubu kivilahtio: bug 18226: is it expected to add etc/schema.pl? 18:35 CrispyBran cait, are you there? 18:36 CrispyBran tcohen, do you write patches? 18:37 CrispyBran Anyone online that writes patches? 18:38 CrispyBran tcohen, do you use the kohadevbox? 18:39 CrispyBran When I edit a file, isn't only supposed to edit it under the branch I am in? 18:41 CrispyBran when I go back to master, it shows the edited file there as well. 18:41 tcohen can u elaborate a bit? 18:42 CrispyBran Would you mind walking through something with me? This is my first patch. 18:52 CrispyBran So, I could hash or stash, but can I mash? 18:52 CrispyBran I could trash. 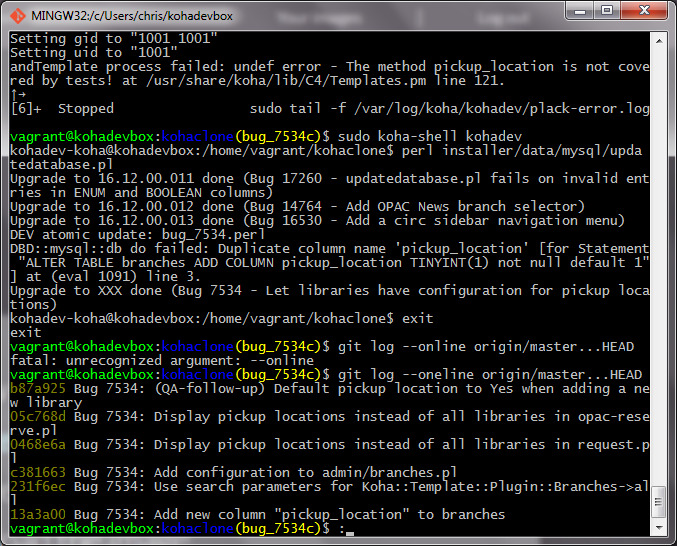 18:52 kchris_away #koha, I am troubleshooting a plack error on kohadevbox. 18:53 kchris_away How can I verify that plack restarts successfully after a restart_all command? 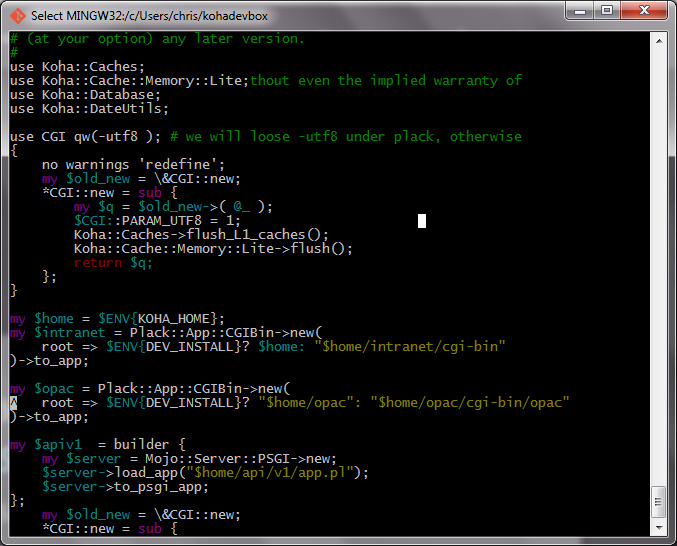 18:58 kchris koha-plack-err shows the server closing, then starting. 19:01 Joubu kchris: it's about 7534 I guess? 19:01 kchris I have applied the db update..
19:02 kchris and when I log into mysql, I see the new column in the branches table. 19:11 kchris I'm using kohadevbox with repo on my host. 19:11 Joubu when do you get the error? 19:12 Joubu just by hitting admin/branches.pl? 19:12 kchris And I don't get the error on master. 19:12 kchris Just when I am on the branch with the patch. 19:16 kchris Okay. I ran those commands. Still getting the internal server error. 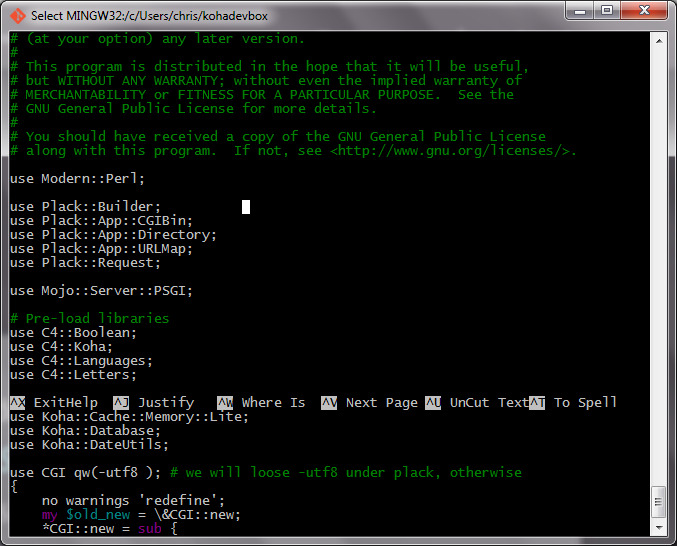 19:21 Joubu kchris: git repo is up-to-date, right? 19:22 tcohen kchris have you ran restart_all ? 19:22 tcohen after running the upgrade? 19:24 kchris I have been using git on the guest for updating my repo, using bz, etc. 19:26 Joubu tried my change request? 19:33 kchris Joubu: I added pickup_location to the arguments passed to the list of known methods. 19:34 kchris and I restarted plack again. 19:35 kchris each time I still just get the template process failed error message. 19:36 kchris one more line of the same error message. 19:36 kchris so far, it looks the same. 19:40 kchris where do you see that? 19:42 kchris that's a relief. 19:44 Joubu kchris: is it a fresh devbox? 19:45 Joubu first lines say "use lib /path/to/lib"
19:52 kchris Ok...still working on this. 19:54 kchris on my guest, I'm just using nano. 19:54 kchris on my host it's easier: i use gui editor. 19:54 kchris can I edit this on my host? 19:57 Joubu "No idea if this list is still active" hum? 19:59 Joubu what do you see? 20:03 CrispyBran tcohen: is there anything specific I need to do with the commit? 20:04 CrispyBran What I mean is, do I need to edit the commit, or just commit it without changing the message? 20:13 Joubu @later tell kchris edit /etc/koha/sites/kohadev/koha-conf.xml, you should see a dev_install tag with "1"
20:13 huginn` Joubu: The operation succeeded. 20:20 kchris Joubu: I don't see a dev_install tag. 20:27 huginn` Bug 18219: minor, P5 - low, ---, koha-bugs, Needs Signoff , "Not checked out." problem message displays twice on local use. 20:40 wizzyrea CrispyBran_lunch, we aim to always be ncie. 20:41 Francesca say hi to the gang for me! 20:46 kchris Joubu: I added the <dev_install> tag inside the <config> tag. 20:47 kchris and checked the plack errors while hiting the page. 20:47 kchris I am still getting the same error. 20:47 kchris Maybe its time i just do another fresh install. 20:48 kchris I installed about 2 weeks ago.